Home » Food Lift » Food Lift or Restaurant Lift – We look at catering lift options available! Food Lifts are in hot demand right now with a surge in new Restaurant openings across the UK, in particular Restaurant Lifts in London. 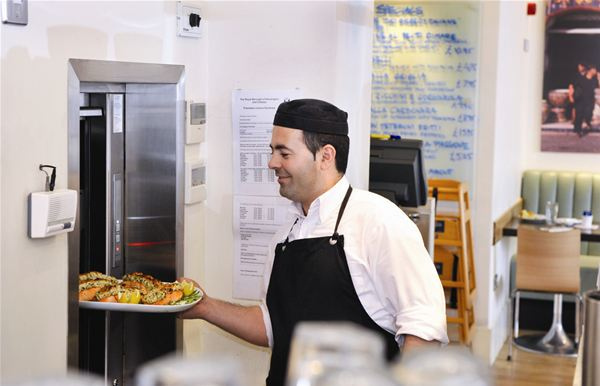 If you have stumbled on this blog, you will no doubt be looking into the idea of having a food lift in your Restaurant, Cafe, Deli and the list goes on…. Why food lift or restaurant lift? The typical name used is the dumbwaiter which of course relates to the tireless work the lift puts in to act as your extra waiter for the night, good news… it never takes a night off, calls in sick or stands looking at its latest facebook status! Its hot in the kitchen! More often than not, this little genius invention is the lifeblood of any good restaurant and often connects multiple floors together that would be a health and safety minefield without the food lift. We also do a lift method statement and lift risk assessment to dot the I’s and cross the T’s with that in mind. Catering Lifts – whats the difference? Catering lifts are often floor loading lifts to take hostess trolleys and a small amount of hand carry able goods such as stock food items and cases of drinks. They usually come complete with hinged lift doors instead of the slidey up and down type that a typical dumbwaiter (restaurant lift) would have and tend to have a capacity over 100kg. A high density of our food lifts are found in places like London, Birmingham, Manchester, Edinburgh, York and Glasgow to name a few. It is always exciting when we spot one of our food lifts out and about in the city (I know, we are lift geeks). We have a wide range of sizes for the restaurant lift and can offer a bespoke restaurant lift service should you have an odd sized space or want something a little more front of house. Service Lift Co are ready to get your restaurant kitted out with the latest in food lift technology.